I live around the corner from a wonderful Chinese tea shop, Seven Cups. 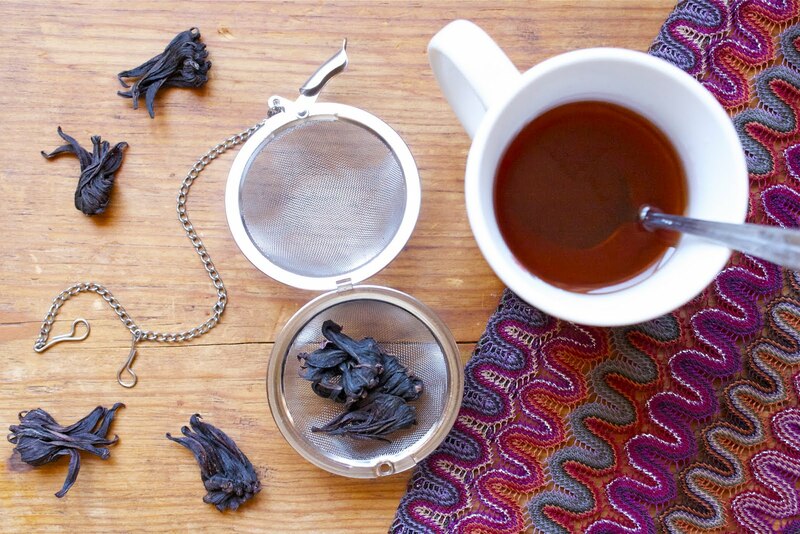 Yesterday, I was looking for a gift to give a fellow tea-lover, when I came across these dried hibiscus flowers. 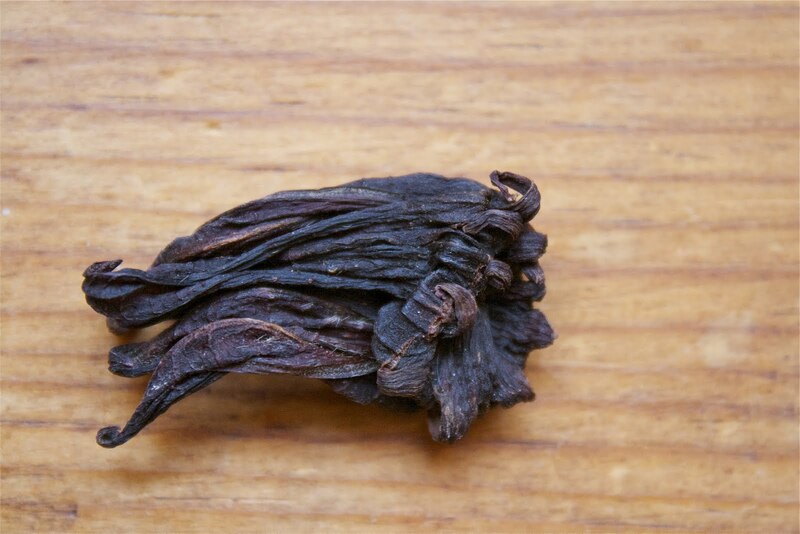 Pictured is Chinese hibiscus, but you can also find hibiscus flowers in Latin specialty food stores (usually in a bag labeled "Flor de Jamaica"). Hibiscus tea has tart fruity and floral flavor, and contains Vitamin C. An added benefit is that hibiscus tea has been linked in studies to reduce cholesterol and high blood pressure, so drink up! There's only one problem: my air-conditioner is broken. It's a summer's midday in Tucson. I don't want to drink hot tea. Solution? Lemon Hibiscus Sorbet. 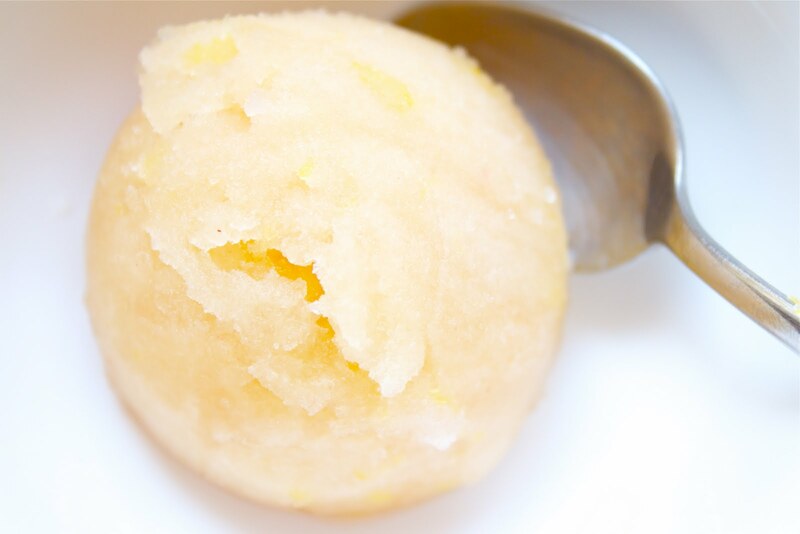 This sorbet is delightfully light and refreshing, and has more depth of flavor than your average glass of iced tea. I cut back the amount of sugar in the original recipe because I really wanted the lemon and the hibiscus to be the stars. I found myself going back for thirds, so I think this recipe is a keeper. Lemon Hibiscus Sorbet is my perfect temporary relief from the sizzling summer. Bring water to a boil in a saucepan. Add hibiscus flowers, remove from heat, and let steep for 15 minutes. (You could stop here and drink tea, but the sorbet is so good! I promise it is worth the wait...). Pour the hibiscus tea through a fine-mesh sieve into a metal bowl and discard the hibiscus flowers (I find the flowers are good for another round, so NOW you can make some tea just to drink :) ). Return tea to saucepan and bring to a boil with sugar and a pinch of salt, stirring until sugar is dissolved. Transfer mixture to a metal bowl and place in freezer for 20 minutes. Remove metal bowl from freezer, add lemon juice, and freeze in ice cream maker, adding the lemon zest at the last minute. Transfer sorbet to an airtight container and place in freezer to harden, for at least 3 hours. That sorbet sounds like the perfect thing to have on a hot, hot day! Yum, headed to wholefoods hope the have hibiscus! Gorgeous Sorbet! I bet it is wonderful! Wow - that is SO beautiful! I have seen hibiscus flowers around for recipes, but never tried. I never made a sorbet but I feel like I really really should. Yes. That sorbet looks incredible! I can't wait to make some! Wow! This sorbet looks soooo delicious!!! Thanks for sharing the recipe! 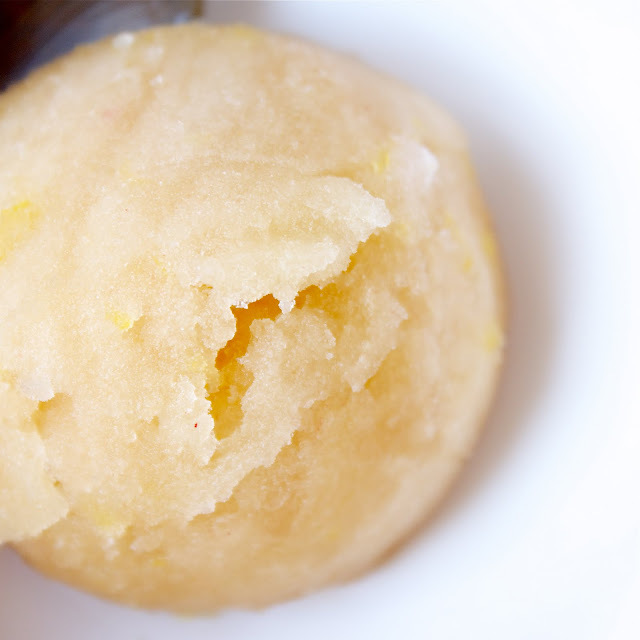 I recently did a yellow plum sorbet and it was so fantastic. (Posted the recipe on my blog!) - I love how easy it can be, and it's sooo yummy! How very interesting! This is so creative and I imagine so delicious. Fabulous pictures! interesting that you show a pale yellow sorbet. i have used hibiscus any times and it turns everything deep red. how did you manage to maintain the yellow color?? i am so excited to try this! sounds delish! What a beautiful sorbet...love Hibiscus! @ darlateachesyoga - I used a Chinese hibiscus that made a rather tan tea, so with the ice and lemon, the sorbet came out a pale yellow/tan color. @Curious Cook - that concentrate is a great idea! I live in the desert and I'm always looking for ways to change up water, since I'm constantly drinking. Thanks! I am doing an end of summer ice cream round up on my own blog, All Day I Dream About Food, and would love to include this recipe. I would use one of your images, and link back to you, but I wouldn't be posting the recipe directly. If you would like to be a part of it, please email me at carketch29 (at) yahoo (dot) com. Nice recipe, But i would like to ask that is this Lemon Hibiscus Sorbet is good for health?? Today's Photo: Lost Boy Beach, Again!